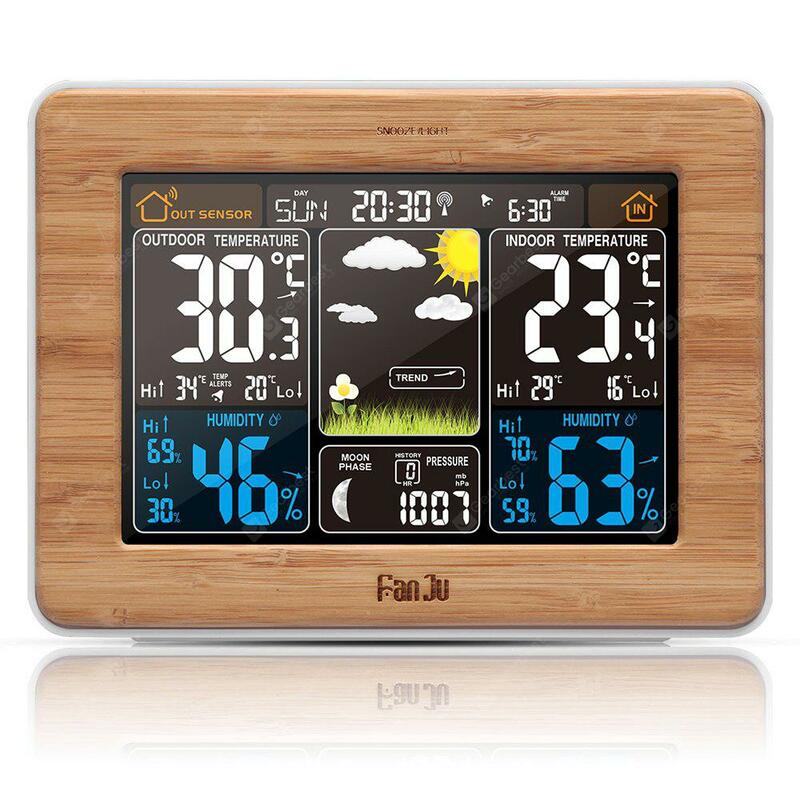 FanJu FJ3365 Weather Station Color Forecast - WOOD w cenie $25.99 | Chińskie kupony rabatowe, zniżki i okazje! TheFanJu FJ3365 Wireless Weather Station can give you the answer. All functions such as color weather forecast, thermometer and hygrometer, temperature and humidity, barometric pressure, calendar, moon phase, daily alarm and snooze light combined, this Compact Weather Forecast can get you always keep in touch with the changing weather condition. ● This weather forecast displays the 7 following color icons: sunny, slightly cloudy, cloudy, rainy, heavy rainy, snowy and heavy snowy ( with outdoor wireless remote sensor range up to 200 feet ). The weather station automatically starts receiving a transmission from the outdoor sensor ( maybe take 3 minutes ) after batteries inserted or DC adapter plugged in. Also can press the TX button inside the outdoor sensor to make the connection more quickly. ● When the station starts to receive the DCF signal, the backlight will not keep lighting even DC adapter plugged in. And all buttons except + will not working during DCF receiving model. You can press the + button to stop searching radio signal, and then all buttons can function again. ● If outdoor data do not display or incorrect. Please press – button 3 seconds to reset the data and click the TX button on the outdoor sensor to re-connection. ● Backlight will keep lighting with power adapter. If weather station run with battery only, backlight only active for 15 second by press the SNOOZE LIGHT button, it may a little hard to see the display without backlight.